In order to fulfill your needs, Sleep Sheep Phuket Hostel & Cafe’ offers many types of both private rooms and shared rooms which can receive up to 70 guests in total. To make you feel comfort like you stay at home, we offer the warmth and friendly atmosphere as well as relax and clean room and area for our guests. Our cafe' also serves a good quality and reasonable price of coffee and homemade desserts for all day. On your lazy day, you are welcome to spend your day in our cafe' with a cup of coffee or tea. Free wifi and plug sockets are available for you. The rooftop garden is the new common area in our hostel, either party with your friends or relax yourself with the movies, yoga or whatever you want this is the area for you. 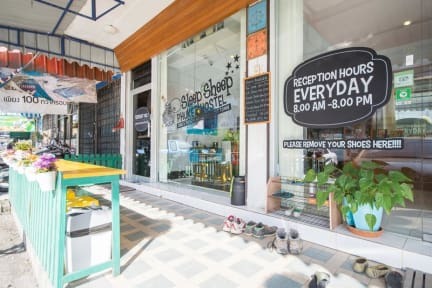 Even Sleep Sheep Phuket Hostel and Café is located in Phuket Town area which is AROUND 20 KM FAR FROM BEACHES, but we also has a lots of activities here such as street art for your shoots, Chino – Portuguese Building and Museum, Local Foods for who love to learn how local people are. Night Markets and Sunday Market for who love to eat and shopping etc. Our hostel is 20 mins far from the beaches. PLEASE DO NOT BOOK OUR ROOM, IF YOU WANT TO STAY BY BEACHSIDE. NOTED: We offer both FAN and A/C Dorm room, please do not complains for the hot weather if you book the FAN DORM!!! Sleep Sheep Phuket Hostel and Café has NO ELVALATOR and offer NON SMOKING hostel, but if you wish to smoke, we do have a smoking area. For late check in Guests, we will leave your room key in the key box at the front gate. Please check it when you arrive. -THAI BATH CASH ONLY, prepayment is requested at the time of checking in. Great place to stay. Forgot something there and the staff were great at coordinating shipping it back to me! Excellent hostel, we had to do a late check in and we had no problems. The staff were really helpful from the late check in to booking ferries and not to mention they great breakfast they gave us. The hostel is clean and looks very new with many decorations which gave it a great atmosphere. Would recommend for anyone that had to do late check in or what’s to stay in Phuket town ! I never really review places, but this one deserves my time. I was amazed by hospitality and kindness of the staff of hostel. There is a delicious breakfast every morning which is not milk and cheap cereal like in most places. I strongly recommend this place as a chill spot in Phuket Town. The double bed private room is priced for what's available. It's fair. I didn't experience it as a social hostel. Bed is firm. Staff leaves at 11pm. Staff was friendly. Breakfast was ok. Eggs toast and fruit plus instant coffee. The blanket on the bed was actually a beach towel. I asked for a blanket and got another towel. Tv in the room didn't work and staff didn't acknowledge that. Good location for Old Town Phuket. Relatively clean but there's not a no shoe policy. While the was staff was very nice and well accommodating, the beds we were given had stains on the pillows and comforters. The term AC was also a loose term. We ended up checking out and moving to another hostel around the block. If you can handle the humidity and heat you should be fine but I would recommend a few other hostels in the area before this one. Appalled by the high rating for this hostel. Arrived and there was no place to lock bags. The staff couldn’t give a single suggestion of what to do in the area. When I finally got to my room, it was mediocre. The blinds didn’t entirely cover the windows, which made me extremely uncomfortable since they were right by the bed. Also, there was a gap under the door which let in mosquitos. To put the icing on the cake, there was a lizard climbing on the wall inside my room. Gross.